Follow Nikon Instruments for microscopy news and trends, updates on new products, and information on contests and promotions. Nikon is happy to announce a workshop on Seamless Imaging: Widefield – Confocal – Super-resolution at Goethe-Universität in Frankfurt, Germany from October 10-13. Bring your favorite sample and try out all three imaging techniques on the same Ti2 microscope! Please also join us for a talk on imaging techniques by Dr.s Klaus Nettesheim and Simone Lepper, followed by an application-specific talk by Dr. Guido Wabnitz (Heidelberg University). Announcing the latest breakthrough in confocal imaging: the A1R-HD resonant scanner from Nikon! This new high definition and low noise resonant scanner yields similar image quality as traditional galvo scanners (image below) and can now scan up to a 1k x 1k area. Differentiation of induced pluripotent stem cells (iPSCs) into neural progenitor cells (NPCs) is well documented, but new research in Scientific Reports describes in detail the transition of iPSC-dervied NPCs into functional neurons. 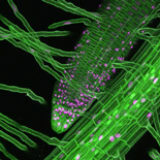 Nikon Instruments Inc. today unveiled the winners of the seventh annual Nikon Small World in Motion Photomicrography Competition, awarding First Place to Daniel von Wangenheim from the Institute of Science and Technology Austria for his time lapse video following the root tip of Arabidopsis thaliana (also known as the Thale cress). The video reflects a time lapse of 17 hours and approximately 4mm of growth. Von Wangenheim and his colleagues are studying how plants perceive and respond to gravity. On October 15th, 1997 Cassini was launched into space on its voyage to Saturn. Now more than 18 years and countless images later the mission has come to a close. Click to check out the amazing final images. New work in Scientific Reports finds that many bivalves do not adjust to changes in ocean acidification over multiple generations. Climate change is thus likely to have a continued and severe impact on populations. Imaging for this study was performed with the help of a Nikon digital camera. Research in Nature Biomedical Engineering reports the development of a new dendrimer for the treatment of cancer by depletion of bioavailable copper. Confocal imaging was performed with a Nikon A1R microscope. Research in Nature Cell Biology illuminates how myofibrils squeeze the nucleus towards periphery of myofibres. Imaging was performed with help of a Nikon Ti inverted microscope. Colocalization of Syntaxin 1A and L-type voltage-gated calcium channel resolved with help of Nikon N-STORM Super-Resolution Microscope System. A new fluorescent mitochondrial superoxide probe, MitoNeoD, is published in Cell Chemical Biology! Imaging was performed with a Nikon A1R confocal microscope. New Janelia Fluor dyes utilize 3-substituted azetidine functional groups, allowing for precise tuning of spectral and chemical properties. Nikon's super-resolution N-SIM and custom STORM system illuminates the 3D structure of the ciliary transition zoney. This research has broad implications for the treatment of ciliopathies, such as Meckel Syndrome. Nikon Instruments has a new position open for a Biosystems Technical Specialist! This position is based in New York and the primary responsibility is troubleshooting advanced imaging product lines, with about 25% travel. Epithelial cells grown on viscoelastic substrates found to aggregate and form cell-free areas in a process driven by vinculin translocation. Imaging was performed using a Nikon A1R confocal microscope and BioStation IM-Q live cell incubation and monitoring system. Chikungunya virus outbreaks have made the news with worldwide outbreaks, but new research in Nature Microbiology shows that infection activates the NLRP3 inflammasome, and provides a pathway for therapeutic solutions. Confocal imaging was performed using a Nikon A1R. Did you know that leprosy is caused by Myobacterium leprae? New research details how M. leprae infection of macrophages leads to demyelination and axon damage in nerve cells. Imaging was performed in part with a Nikon A1 confocal microscope. New multi-focal SIM technique improves volumetric imaging speed by an order of magnitude. New research in Nature Medicine shows that elimination of senescent cells in mice results in higher bone mass and other benefits. Fluorescence imaging was performed using a Nikon Ti inverted microscope. Did you know that macrophages sometimes release live pathogens in a process known as vomocytosis? Researchers have now identified ERK5 as the first known host-signaling regulator of this process. A Nikon Ti-E inverted microscope was used for imaging. New research explores optical micro-printing tech for fabrication of microscaffold arrays for 3D cell culture. Imaging was performed with a Nikon C2 confocal microscope.